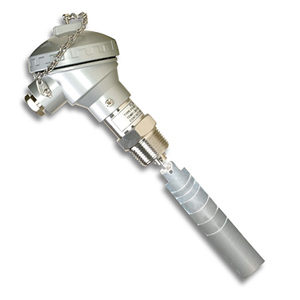 The FSW-25 flow switch utilizes the force of liquid flow to propel its paddle and to detect the incoming flow or movement of the existing liquid in the pipe. In static liquid or no liquid, the spring is in expanded and presses the magnet downward. The reed switch is normally open. As flow occurs and the paddle is raised at an upward angle of 20 to 30 degrees (or more), the paddle will push the magnet upward to actuate the reed switch which then closes the circuit. The length of the paddle can be adjusted to the diameter of the pipe. 1" trim size can only be used with metal pipes. The installation is simple. Cut the paddle to desired pipe size. No smaller than 1" pipes for metal pipes. The FSW-25 is not recommended to be used in 1" plastic pipe (1-1/4 is the minimum for plastic pipes). Before installing the unit to a tee pipe, be sure to apply tape seal to the screw then tighten up. The FLOW mark on the screw hexagon must be parallel to the pipe and the ground. 1" 1-1/4" 1-1/2" 2" 2-1/2" 3"
참고: Units come with complete operators manual.